Introducing Sunnyside! This fabulous, newly renovated home is in the grand opening stage, renting for the first time in the Canaan Valley area. Landis Realty is proud to offer this gorgeous location. Completely remodeled and lavishly furnished, decorated with every amenity you can imagine. Sunnyside has a kitchen lavishly stocked with kitchen wares and devices, a coffee bar and plenty of space for bringing your supplies including side-by-side refrigerator/freezer and a beverage/wine cooler in the kitchen and an additional refrigerator/freezer in the garage. The kitchen also has a regular oven and convection oven. The gas cook-top has 6 burners and an indoor grill. The coffee bar includes three coffee makers-one drip, one thermos drip and one Mr. Coffee Kuerig. Two booster seats for kids are available. Elegant mountain luxury including fabulous views to your own lake with a private beach & dock, kayaks available to enjoy in a peaceful private location. Decks & Walkways surround the outdoor area for true indoor/outdoor living experience with swings, comfortable outdoor seating, natural gas grill, Hot Tub, Fire-pit outside, kayaks and corn-hole for your enjoyment and more. Plush comfortable beds in every sleeping area. This home has several escape-away locations including a game room with entertainment area, private card play area, a kitchen with several cozy areas to relax, and entertainment rooms for all age ranges. Guess what? Sunnyside has tankless hot water which means that the hot water lasts for as long as anyone wants to shower, plus all the showers can be used at the same time. It is sweet!! This home is a true family escape. WiFi is free. Plenty of parking. Fishing in pond permitted but we ask that it is catch and release with barbless or flattened barb hooks permitted. Spruce Island Lake, and surrounding mountains & pasture hiking available with Sand Run Lake Trail and Spruce Island Lake Trail within walking distance. Sunnyside is your home-away-from-home while exploring the fabulous Canaan Valley and beyond. Notice: Sunnyside decks, high mountain areas, ponds, pools, grill, firepits and any area of property on and around rental homes are used at the risk of the renter. Please use all homes with safety, responsible and careful consideration. Use at your own risk. Use of boats, kayaks, canoes, and swimming area, at the risk of the renter. Personal flotation devices are the responsibility of the guest. Sunnyside 11 provides life jackets for the renters. Overall, we had a great time. The house is very spacious with plenty of activities in the house like an air hockey table, foosball, card games, books and more. The hot tub was great for chilly evening dip. We stayed for Thanksgiving and the kitchen is meant for cooking big meals. The master bedroom ran a little cool at night as it is partially above the garage but we like a cool bedroom at night. It helps us sleep. The rest of the house was nice and toasty when it got into the high teens at night. Had a great time. All of the guests loved the house. Every accommodation you could think of was included. The rental service and process was flawless and friendly. It fit are group perfect , 5 from us !!!! We all had enough private space when we needed it and super great gathering space when we wanted to be together! Very large home and it has everything you need! Games hot tub excellent quality furnishings every kitchen appliance and tool you can imagine and service wear for 18 plus! Spotlessly clean! We have been vacationing together for decades and hands down this was one of the best rental homes we have ever been in. Everyone was happy wit the accommodations, furniture and location. The owners took such care to make sure everything was perfect for their guests. The lake, the hot tub, the game room, the reading nook, the amazing kitchen, the comfortable beds. I could go on about this wonderful property. Also the staff at Landis was kind considerate happy. I just found the experience wonderful and look forward to returning to this property and area again. It was a privilege to stay here. We had a wonderful time at Sunnyside. The house was perfect! The owners did a great job of updating the home. There were plenty of activities to keep everyone busy or just sit on the deck and relax. Landis Realty did a great job of coordinating the rental. The entire process was very smooth and easy. We were concerned that we wouldn't be able to find a home that could handle three families, but this home was a perfect fit. 5 bedrooms uniquely positioned for privacy while at the same time providing a super large kitchen and living area to get together. 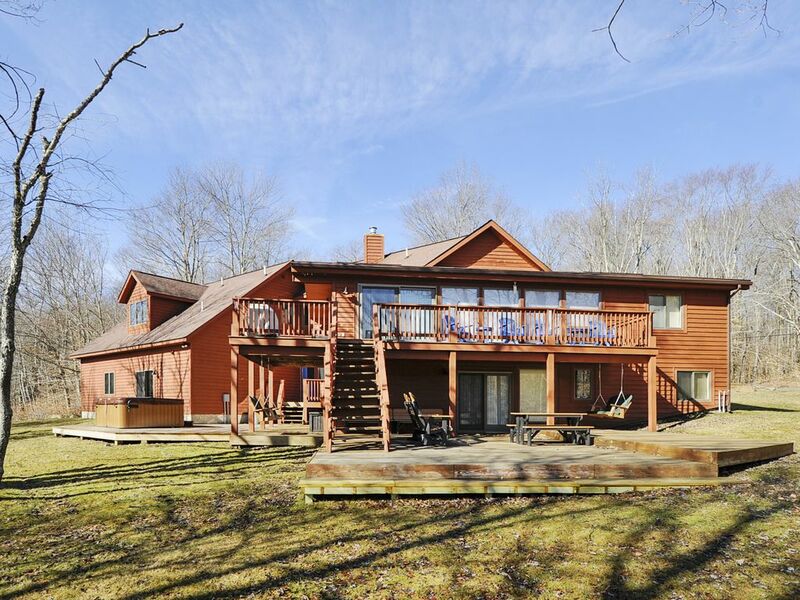 The location was great not only because of easy access to Dolly Sods, Davis/Thomas/Blackwater, and the entire Canaan Valley, but also to the gated neighborhood with tons of trails, lakes, wildlife. The small lake just outside the back of the home was great for fishing, kayaking (2 provided) and relaxing by the fire pit. Landis Realty made the entire booking, check-in, check-out process easy. Highly recommend this property! Landis Realty, LLC provides seasonal rates for all homes. If you do not find satisfaction in your rate display or are interested in inquiring about discounts, we encourage you to call the Landis Realty Welcome Center at 304-866-2110. We look forward to serving you!